GRID Autosport thrusts players into a high-speed career as a pro-racer, challenging them to compete in the world’s most exciting cars on motorsport’s most challenging circuits across five different racing styles. 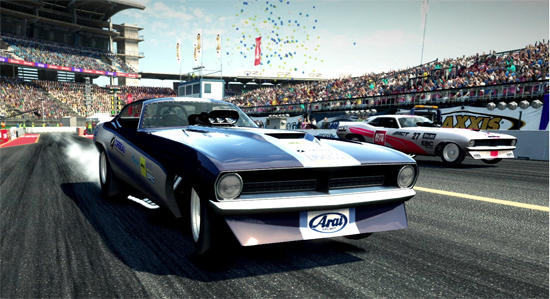 Players will take on aggressive pack racing in Touring Cars, test their stamina and concentration in day-night Endurance events, demonstrate their car control in Drift competitions, perfect their finesse and precision in Open-Wheel races, and hone their reaction times on the tight circuits of Street Races. Engineered with intuitive tilt and touch inputs, GRID Autosport delivers an irresistible mix of simulation and arcade handling. Its best-in-class controls allow players to use their screen as a steering wheel, and use the touch-screen interface to control their speed. GRID Autosport also offers full MFi gamepad support. Alongside a huge range of cars including the McLaren 12C GT3, Dallara F312, Mazda RX-7 (FD3S) Drift Tuned, Audi RS 5 Coupe, Pagani Zonda Revolución, and 75 other high-performance motors, GRID Autosport features 100 routes spread across 22 charismatic locations including Hockenheim, Yas Marina and San Francisco. “Adapting a racing game of this scope and quality for iOS has been a challenge, but playing GRID Autosport on iPads and iPhones is a blast,” said David Stephen, Managing Director of Feral Interactive. “This iOS version does Codemasters' magnificent game justice, and we are thrilled to bring it to a new audience." GRID Autosport will be available from the App Store for $9.99/£9.99/€10.99. It will not have any in-app purchases - all DLC is available to download for free. GRID Autosport requires an iPhone SE, iPhone 7 or newer, an iPad (2017) or any iPad Pro, and iOS 11 or later. 6GB of free space is required to install all content (which includes the base game with all of the free DLC packs), and we recommend having at least 8GB of free space to avoid installation issues.